In 1914 the S.S. Komagata Maru left Hong Kong for Vancouver carrying 376 Punjabi migrants. Chartered by railway contractor Gurdit Singh, the ship and its passengers were denied entry into Canada and eventually deported to Calcutta. In Across Oceans of Law Renisa Mawani retells this well-known story of the Komagata Maru. Drawing on what she terms “oceans as method”—a mode of thinking and writing that repositions land and sea—Mawani places the Pacific, Indian, and Atlantic Oceans into conversation to track the circulating legalities that connected the Dominions, colonies, and territories; the shifting intensities of racial, colonial, and legal violence that joined indigenous dispossession, transatlantic slavery, and Indian indenture to so-called “free” migration; and the transoceanic repertoires of anticolonial critique that challenged the empire’s underlying racial, spatial, and temporal divides. 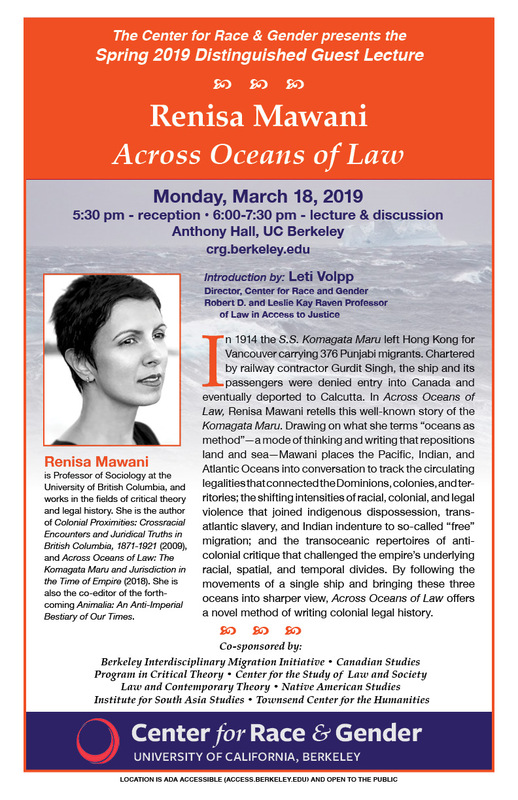 By following the movements of a single ship and bringing these three oceans into sharper view, Across Oceans of Law offers a novel method of writing colonial legal history. The book, Across Oceans of Law, will be available for sale at this event by Eastwind Books.